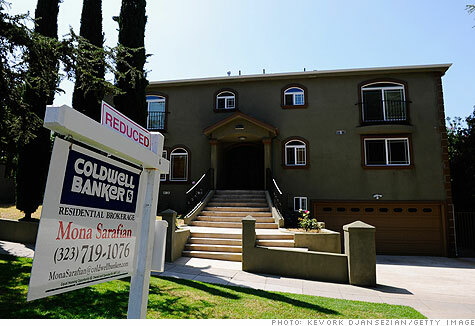 NEW YORK (CNNMoney.com) -- In the latest sign of renewed turbulence in the housing market, an industry group said Thursday that sales of existing homes fell 5.1% in June. The National Association of Realtors reported that existing home sales fell last month to a seasonally adjusted annual rate of 5.37 million units, down from 5.66 million in May. Sales year-over-year were up 9.8%. Analysts had expected sales to fall to an annual rate of 5.09 million units, according to consensus estimates from Briefing.com. "The housing industry is slogging through a swamp looking for solid ground," said Mitchell Hochberg, a principal at Madden Real Estate Ventures. "With mounting foreclosures, growing consumer pessimism and a rise in inventory, the only path to recovery is an increase in employment." June sales still reflect the impact of a popular $8,000 tax credit, which is due to expire in September after Congress extended the June 30 closing deadline. But analysts expect the housing market to deteriorate as the credit expires and unemployment remains high. Meanwhile, the inventory of homes on the market rose 2.5% in June to 3.99 million units. At that level, it would take 8.9 months to sell all the existing homes on the market, compared with 8.3 months of inventory in May. "The supply of homes on the market is higher than we'd like to see," said NAR chief economist Lawrence Yun, adding that home prices have held up well despite the glut. The national median existing-home price for all housing types was $183,700 in June, up 1% from a year ago, according to NAR. The report comes after government data showed Tuesday that new home sales fell to an 8-month low in June, while the number of building permits issued in the month rose.